Thoughts on Part 1, Part 2, and Part 3. As is obvious by now, I have been reading like a mad woman who rushes through her day to get back to the series, and remains sticking to the words and the bygone era, oblivious to sleep and other such mild concerns. Anyway, this addiction needs to tone down or the series needs to end soon, whichever comes first! The fourth volume begins with the Crown Prince Aditya Karikala journeying down south to get to Kadambur, to mainly meet the young Queen, Nandini. The Crown Prince has been trying to atone for a rash act of his. The haunting images of the past and his unyielding conscience turn him into a tortured soul. In this state, he is unsure of whom to trust, and whom not to. Although his trusted messenger Vandiya Devan brings him news and tries to unravel all the mysteries, he still vacillates, unsure of what the truth is. Back in Tanjore, The King Sundara Chozha frets over his sons, unable to understand why he can’t get either of them to come to Tanjore to meet him. 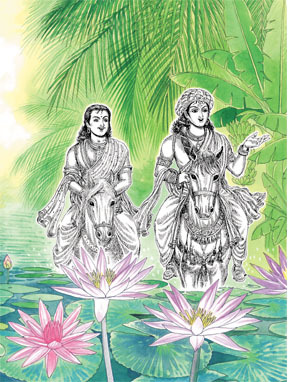 The Prime Minister and Princess Kundavai try to ameliorate the King’s distress by attempting to resolve his fears and mysteries from the past, but the poor King is too warped up in the manipulative games of the conspirators, that even he doesn’t acknowledge the truth amidst the overwhelming confusion. Therefore, this volume shows the true burden and mental anguish that comes with being a member of the royalty - especially being a reigning King or Crown Prince. Kalki brings out the moral predicaments and questions that plague the valiant warriors - at the end of the day, no matter how virtuous one is at heart, isn’t it a crime to murder one’s “enemies” in the name of conquests and territorial hunger? Lives are lost and ruined, and the defeated clan nurtures a blood-thirsty revenge which sets loose another revolt. How will this vicious chain of revenge subside if it continues down the generations, resulting in more violence and vengeance? Trapped within a murky wheel of revenge, pride and territorial-ego, what is right, what is wrong, and what is moral? This volume is fast-paced and ends with the question of how the truth will ever surface to convince the key players and rescue the Chozha dynasty in time. To add to all the political entanglements, the “love-triangles” between the characters turn into importance as they seem to dangerously impact the turn of events. The words fly past the pages and the characters fully come to life to reenact history. And I am desperately glued to the pages till I see the ending!